Hey, Marcus is in town! Lone Survivor arrived in Europe, and I got the chance to see it first time as it came into the movie theater. I have read the book and listened to everything about it on the web. I have known the story behind the movie for several years now after watching Marcus's talks on Youtube. I also remember hearing the news when the Operation took place in 2005. I was quite excited to see the Lone Survivor movie because Marcus himself was involved in the filming, and the SEALs were on the set all the time to make sure there was realism in every scene. I saw the Kingdom also just a few weeks ago on TV, and that added confidence that Peter Berg, the director of the Lone Survivor, was competent to produce a quality piece. In addition, he had been embedded with a SEAL team in Iraq - that created an expectation that he really gets what the SEALs are like in the real world, thus he could depict them also most accurately. He had surely done his homework - but would it all be put to good use in producing a great end result? I have to admit that the first trailer seemed a bit cheesy, because it was plastered together from so many pieces out of context. I was like - Oh no, this is going to be a shallow story, as any director could have put together a simple trailer like that, where the men have captured the sheep herders and are facing a difficult decision. Then, later as more trailers came out I was like - Hey, this stuff has quality now. Then there were videos on Youtube about how Marcus was involved in the making of the film, and how Pete insisted on taking care of all the details - which was reflected in the SEALs' gear loadout, to movement, and tactics. It started to look very good. Still, without seeing the film, I had room for 30% of doubts. Would the film thread itself together, as I was afraid that there were going to be great moments, but in between I feared that there could be inconsistent lower quality parts also? What will Peter Berg as the director bring to the table? I realized that Peter Berg had to make it a good one because he did not want to present bad work to the parents of the soldiers involved, and the SEAL community. Despite of that fact there loomed a doubt in my mind about his capabilities, as I just did not know how great they were. Would he be able to carry the film only to 60%, 70% good quality levels, or would he really make it like 80, 90 - 100 percent great, which would already be touching the skill levels of James Cameron? I expected the battle scenes to be of good quality, but I realized the difficulty of pulling this off. I could not, if I were to imagine that I was in charge, have gotten it done. Another place of doubt was in the actors' performance. Could they get it right? Or would there be some wobbly points, where you would go - Oh, they really lost credibility here? The problem why I and many other people also may have had this false first perception is because you see the actors being in their normal selves as they talk about the movie in interviews. A good sign was that in trailers they had totally different faces on. They looked completely authentic, as if they had been really put into a life threatening situation, where they are alarmed and ready to fight for their lives, as they are being surrounded by a much larger enemy force. I was especially surprised how Emil Hirsch (playing Danny Dietz) pulled this off. He looks a relatively gentle and reserved guy in real life. I had also heard that the film is being nominated for Oscars in regards to sound editing and sound mixing. I was looking forward to something good in that part of the film, but it actually impressed me in many parts of the movie. Firing the M4 sounded as if it was happening only a meter from me, when I was listening to it in the cinema. You get the sense of the immediacy of the bullet flying away, and the shell being thrown out right after it. It had weight to it, and you realized that every shot that was fired had a potential to do some serious damage. It had to be the unmistakable sound of live fire. I talked about this film with a guy who I know, who was actually in the Afghan war in Spetsnaz during the Soviet times. He saw the film before me and told me the following impressions: as he watched it the first time he was engulfed by emotions, and only on the second time he was able to watch it with an analytical perspective. He told me that the guys were weak during the critical moment with the sheep herders! He said that this was war, and that it is full of pain and difficult decisions. I guess he was talking from the position of his old Soviet style rules of engagement, and no doubt back in those days, in the way they were handling these situations - all of the goat herders would have been killed without a second thought. I came home after the movie, and I talked to my father about the situation that the Americans were facing including the pressures caused by the US media, which would be running headlines of their special forces killing innocent civilians. He said that he has been reading the Russian forums about the Chechen war, and the comments from the Russian soldiers who participated in it, suggesting that if they would have been in that scenario, then they would have shot the journalists first! The Spetsnaz guy told me that in the movie I will be seeing how to hold the initiative during a firefight (the way the SEALs were fighting), and also how field medicine is being applied. Before seeing the movie I really wondered what was that going to be like, and during the film I was surprised to see that the things he pointed out where quite good observations. I personally do not agree with his opinion that the SEALs were being weak for not shooting the goat herders. They were in different circumstances because of their rules of engagement, the American military culture, the higher-ups they had, and also the issue with their home country and media they were coming from, not to mention their conscience. In the film the critical decision making point was played out very well and convincingly, where you understood how gray the decision was, and they took the only feasible option, which would not play out well because of the communication failures. The Spetsnaz guy really liked the movie, especially the realism of it. The landscapes were filmed in a great way. As I viewed the landscape many time during the film I felt like - Damn, that terrain is ultra hostile! It looked painful before having to take even one step out there! Some reviews complained that there was too little time spent familiarizing the soldiers before the action of the mission started, but I found that to be untrue. I was actually surprised how Peter Berg was able to create a connection to each individual character, and give a sense of their bond to eachother. Over the years I have watched a lot of material that is out there about the SEALs - the documentaries and everything you can view on the web, but in this movie they have compiled the bits of the Navy SEAL team culture, which has not yet been presented quite in this way as in this film. It really penetrated into giving you a sense of who these guys are, and what makes them unique in their culture in comparison to other U.S. special forces. That was an invaluable part of the movie. When the mission starts, the sound and story made me feel genuine fear. It was like walking out there with these guys. As the events unfolded towards the battle, the tension gets so high that I almost felt compelled to step out of the movie theater. I really though that if I were to recommend to my mother to see this film, she would not be able to handle it. The director warned that this picture was going to be gory. I was afraid of that especially reading the way the injuries were depicted in Marcus's book. I dreaded that I would come out of the cinema with a twisted stomach like after watching Black Hawk Down. Luckily, this did not happen. Some of the trauma had actually been toned down, but the gunshot impacts to enemy and the SEALs were ultra realistic. It was actually how it would really happen. The realism was truly mind-boggling. I have not seen this done so convincingly in any movie that I have seen previously. It was surreal how realistic it was. The mountain battle, the communication between the SEALs, I cannot even describe it how well that was made. You just have to see for yourself. The skill of making this film so realistic was due to the changes of tempo that happens, it really keeps you on the edge of you seat. It was my first time seeing the audience actually being bent to the side when they were sitting! Half way through the film you realize that the Lone Survivor movie is right up there on the James Cameron level of film making, even topping it. It makes you wonder how was Peter Berg able to pull this off? There was never a point where you were looking at the cast as if they were playing SEALs. They were in character all the time. They were being those SEALs. As the actors and real people were shown in the film intermittently, I did not feel a difference, because the actors did such a good job. They had become one of the SEALs. Nine out of ten definitely because I cannot give a 10 for credibility's sake. When I saw Avatar the first time, I felt it was like a film that scored 11 points in my book, but Lone Survivor topped even that. On Twitter the moviegoers commented that what was amazing in the end of the movie is that in U.S. no-one stood up to leave the theater in the end of the movie, when they were showing the names of the men who were in that operation - everyone sat silently to the end. I saw this film in Europe in Tallinn, and I suspected that as a foreign audience, people would stand up an leave in the end of the movie, but no! Just like it was told how it was in America, so it was here. Everybody sat silent and looked at the names of the soldiers. In the end everyone stood up silently and walked out, not even making noise when walking down the stairs of the cinema as ordinarily. I was in awe! 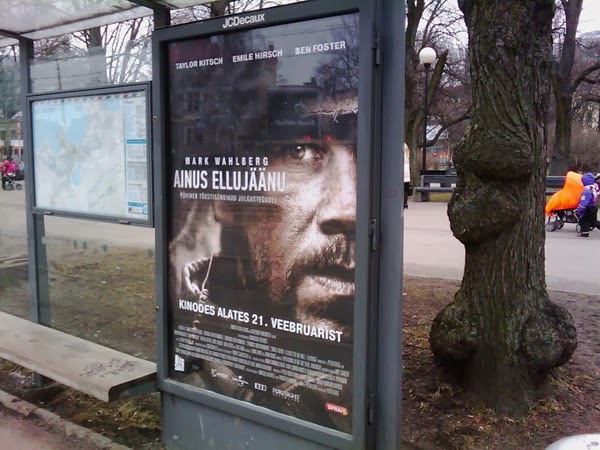 It was also extraordinary to see the center town being full of Lone Survivor movie posters on the day I went to see it (I have a picture of one in the beginning of the review here). I looked at it like - Wow, Marcus has arrived here for a visit. The film had Academy Award quality all over the place. What I was afraid of were the Hollywood exaggerations, but these ended up actually benefiting the movie, as it spiced it up so well. If you want to know how Operation Redwings originally happened, then read Marcus Luttrell's book "Lone Survivor". This movie surprised me in many ways - it had unexpected depth and was gripping to the bone. It is rare for such a film to come out because it takes so much dedication and talent to produce that kind of a result. It should be given 3 Oscars easily. I want to see this movie a second time also, as to be able to take a more analytic view of it, but I am a bit resistant to going to see it again in the theater, because it was such a nerve wracking experience. Still, you can only have the full sense of it by watching it on the big screen. The greatest surprise of this movie was that I did not come out of the theater feeling sad like after Black Hawk Down. I think it was because of the kind of a warrior the SEALs are, and how they fought. In the end of the film I was fighting tears, and probably most of the audience too, as we were glued into our seats. A day later I am listening to its soundtrack, still absorbing the movie in my mind, and I realize what a mind-blowing film it was. I remembered that the music is by Steve Jablonksy, who made a great soundtrack also to Transformers. And I have not even emphasized what a respect I have towards the real men, who fought in that battle against the over-whelming enemy force, cut off from reinforcements. Because of such men I can live in a free country and do what I want, instead of being told who to be by a group of violent fundamentalists.